In the new millennium, leading business organizations have been capturing data about people, turning it into actionable information, and using it to make better decisions. Successful business leaders have been using talent data and insights to drive organizational success by unlocking the power of their people. While business-led talent practices provide considerable benefits for the business and the HR department, comparably little has been written about the value of these activities for business leaders. 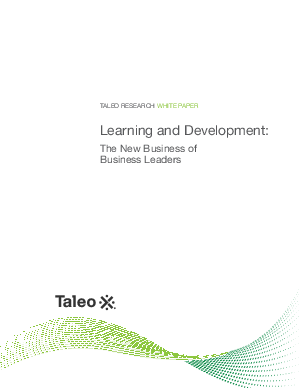 This paper is the fourth in a five part series that explores the role of business leaders in driving talent management functions and the specific tools and approaches that will make them successful. This installment is on challenges and opportunities in learning and development, including keeping critical skill areas current; increasing and broadening your people's skills to face future change; leveraging learning and development as a key driver of engagement and retention; and developing strong leaders, including yourself.